This week, researchers confirmed that Peabody Energy, the world's largest private-sector coal company, has been funding dozens of climate denial groups, including the "Dr. Evil" mastermind behind a number of vicious, over-the-top attacks against the Environmental Protection Agency and the Clean Power Plan. The latest revelations from Peabody’s bankruptcy court documents show the unprecedented extent to which big polluters like Peabody went to subvert climate action. What does it look like when coal companies are secretly funding these kinds of groups? Two years ago, EPA was in the midst of writing the Clean Power Plan, the nation’s first carbon pollution limits on coal-fired power plants. 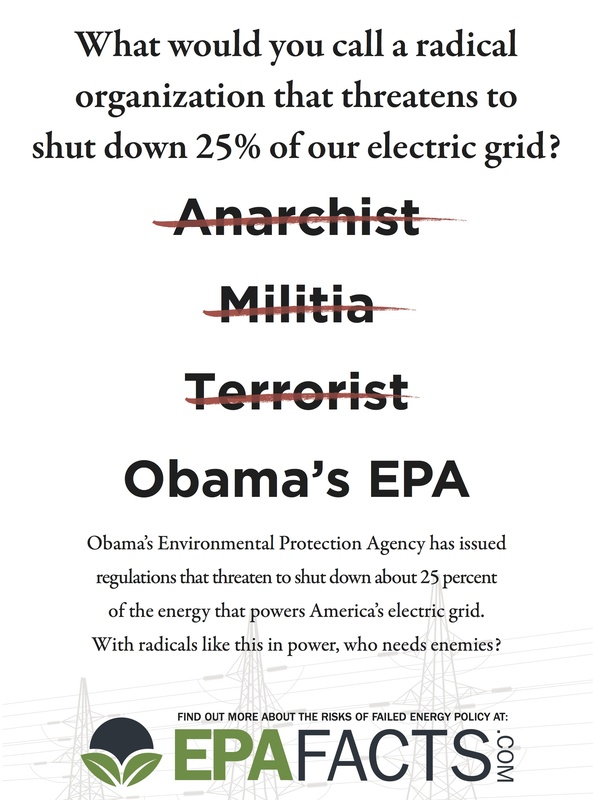 At this time, newspaper ads appeared from an unknown entity that compared EPA to terrorists. The mysterious group that placed these ads emerged from a nondescript address on Vermont Ave in Washington DC, linked to Richard Berman. A year later, Berman surfaced again with more attacks on EPA's Clean Power Plan, making histrionic claims about blackouts and economic devastation. Nicknamed "Dr. Evil" by 60 Minutes, Berman has said "you can either win ugly or lose pretty." Berman prides himself on keeping his industry funders secret, so it's particularly noteworthy to confirm that Peabody, a well-known opponent of the Clean Power Plan, is a Berman client. American Coalition for Clean Coal Electricity (ACCCE): ACCCE is notorious for its aggressive tactics against any pollution limits for power plants. In 2009, ACCCE came under fire for sending fake letters to members of congress opposing major climate legislation. The forgeries were designed to look like diverse constituency groups had sent the letters, including the NAACP, women’s groups, veterans’ groups, and Latino organizations. National Black Chamber of Commerce (NBCC): The NBCC has been criticized by leaders in the African-American community, including by Martin Luther King III, for taking industry funding (from ExxonMobil and others) and promoting discredited reports that exaggerate the costs of the Clean Power Plan and climate action. Willie Soon: This contrarian (and discredited) astrophysicist accepted fossil industry funding to write specific articles doubting climate science, without any disclosure and often without peer review. Soon's work has been cited many times by politicians and front groups seeking to obstruct climate action. Burson-Marsteller: This public relations firm, the largest in the world, has been running Peabody’s “Advanced Energy for Life” campaign to convince us that developing countries must burn coal to alleviate poverty, instead of investing in clean energy (a premise with which the UN Secretary-General likely disagrees strongly). An Australia Institute report concluded that while Peabody is spending top-dollar on this PR campaign, it has not directed any resources to projects that directly alleviate energy poverty. Peabody’s climate denying stance is not a surprise, but the extent of its support for groups that don’t disclose their funding is news. But what will Peabody do from here? In times of crisis, like bankruptcies, companies often make major shifts in strategy to adapt to a changing market. Unfortunately, Peabody is not sending any signals yet that it is accepting the reality of climate change. Even beyond its climate denial, some predict that Peabody will use the bankruptcy to get out of paying for coal mine cleanups or retiree benefits. The best illustration of Peabody's intransigence is the nearly half a million dollars that the coal company is shelling out this year to pay for Professor Larry Tribe to argue against the Clean Power Plan in court -- and that doesn't count whatever Tribe was paid before April 2016 to represent Peabody in earlier proceedings. Professor Tribe's colleagues at Harvard give a thorough explanation here on why his constitutional arguments about the Clean Power Plan do not pass muster. NRDC has collected more than 60,000 signatures asking Peabody Coal to drop its lawsuit against the Clean Power Plan. This would be a major first step to show that Peabody is changing its ways. Peabody needs to leave climate denial behind and accept the inevitable shift to a new market that relies on energy that doesn't wreck the climate. The company has now acknowledged its financial bankruptcy; it’s time to admit that its ideas and political strategies are bankrupt, too.